Facebook is very interactive social networking medium. Besides sharing photos, videos, messages – Facebook friends also chat using online Facebook chat feature. Whenever you login into Facebook account, chat bar pops up at the bottom right. Using that you can chat with any online Facebook buddy and make sure you delete chat history after the chat session is over. 1. Login into your Facebook account and check Facebook chat box at bottom right. 2. Click ‘Chat’ button on the chat bar to expand it into box. 3. Then click on specific friend for deletion of chat history. 4. 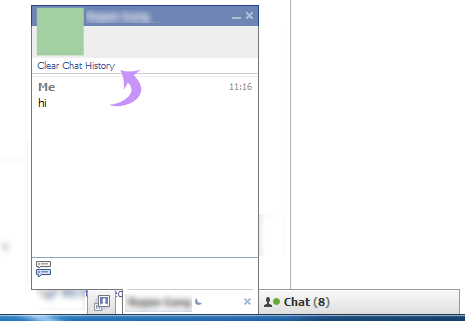 In the Facebook chat box click ‘Clear Chat history’ link to delete chat history. You can delete chat history of different Facebook friends using above procedure and clicking ‘Clear Chat History’ link in respective chat boxes. Please note, this will not delete Facebook chat history if you were chatting using desktop client software for Facebook chat instead of Facebook website. that does not delete it just sends it to another page and someone can still read it. how can you delete it forever without to much trouble. when yoy do it your way it archives it and it cab still be read. which is what happened. we want to get it off the computer. This feature no longer exists on Facebook Chat. is there another ooption to delet it? i hate the new facebook! WOW! What an awesome thing to write a blog post about! Thanks for telling a rather so obvious thing that every troll on this universe is aware of.. LOL! Thanks… that was meant for Facebook starters (noobs) and not trolls.